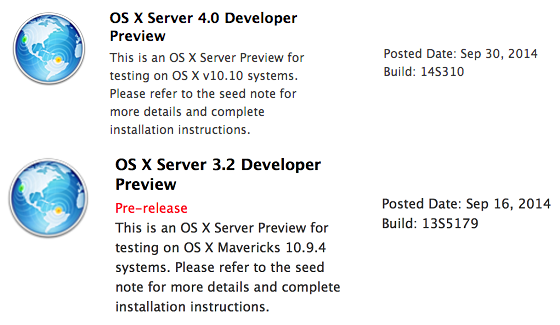 Apple has officially seeded the latest pre-release versions of OS X Server 4.0 Developer Preview (Build: 14S310) and OS X Server 3.2 Developer Preview (Build: 13S5179) to all Mac OS X developers and non-developers (general public users) for testing and experimenting purpose. Mac users can instantly Download OS X Server 4.0 DP (14S310) .DMG Update File and OS X Server 3.2 DP (13S5179) .DMG Update File via Direct Links as posted below. The official changelog of the latest available OS X Server 4.0 and OS X Server 3.2 contains; bug fixes and performance improvement with security fixes for OS X Mavericks 10.9 and OS X Yosemite 10.10. How to Download and Install OS X Server 4 and OS X Server 3.2 Updates Manually? To update / upgrade current software version automatically, Mac users and developers can navigate to Mac App Store >> Software Update tab. Mac OS X developers can go-to OS X Dev Center website to officially Download OS X Server 4.0 / 3.2 Updates, while OS X non-developers and OS X Public Beta Seed Program members can go-to Apple OS X Beta Seed Program website to manually download, install and activate OS X Server 4.0 / 3.2 via iTunes without Apple UDID and without OS X Developer Account for FREE.